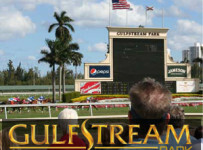 First post is 12:45 p.m. on Saturday for a 12-race card at Gulfstream Park. There is a carryover of $31,599.54 on the Rainbow 6, on races seven through twelve. The feature fourth race is seven furlongs on dirt for 3-year-olds and up. It is an allowance/optional claiming race with a $43,000 purse and a $16,000 claiming price. None of the six entrants are in for that tag. Smartly Agree, a 3-year-old trained by Gustavo Delgado, is the likely favorite. She has a win and four other in-the-money finishes in six dirt races at Gulfstream this year. That record includes a second place finish in the $100,000 Azalea Stakes at seven furlongs on July 2. Cornelio Velasquez has the mount on Smartly Agree, who generally runs from off the pace. Three of the other entrants have early speed, and Smartly Agree could benefit from an early battle for the lead. Those horses are Danessa Again, Pure Bliss and Sweet Parang. Danessa Again, a 3-year-old trained by Gilberto Zerpa, is making just her fourth career start. She is coming off a 13-length maiden win at 6 ½ furlongs at Gulfstream on July 28. Edgard Zayas has ridden Danessa Again in all of her starts and has the mount again on Saturday. 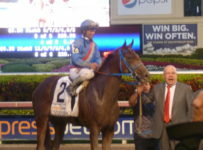 Zayas rode five winners on Friday and three winners on Thursday at Gulfstream. He has 49 victories in the summer meet, placing him second behind Tyler Gaffalione who leads with 76 wins. The summer meet will end on Oct. 1. Gaffalione will ride Sweet Parang for trainer Ralph Nicks. He rode that 3-year-old on Aug. 21 when she broke her maiden with a six-furlong win at Gulfstream. That was her second career start.